Innovation Platforms for the adoption of Climate Smart Agriculture for Family farmers (PIASAC) was a project aimed at creating local knowledge and capacities on climate change and finding options for adaption in a participatory way. The project took place in the municipality of Gracias, located in the dry corridor of Honduras. 38 farming families were involved in a 2-year research process facilitated by the Direction of agricultural science and technology (DICTA), with the methodological support of CIRAD under the coordination of CIAT. The project was funded by FONTAGRO. Muller C, Salgado R, Duran M, Le Coq JF, de Varax M, Gamba-Triminio C, Howland F, Chia E, Andrieu N, Gallardo O. 2018. 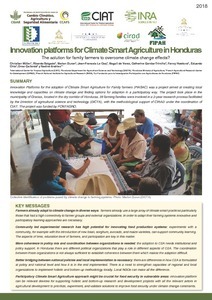 Innovation Platform for Climate-Smart Agriculture in Honduras. CCAFS Policy Brief. Wageningen,the Netherlands: CGIAR Research Program on Climate Change, Agriculture and Food Security (CCAFS).